Padawan Caleb Dume has found his place in the universe, a place in war. He has good friends in the Clone Troopers he serves with. He has an attentive and wise master in Depa Billaba. And of course when everything is going right it goes wrong! The Clones turn on Dume and his Master after the transmission of Order 66, kill the Jedi. Caleb, the future Kanan Jarrus, is forced to fight his way to freedom and die. Once on the run, Caleb discovers that the Jedi may have not have equipped him to survive alone in the universe. And he hopes to reunite himself with the Jedi Order so he is no longer alone, hungry and tired! But he might be forced to learn new skills and new morals to survive. I know that Kanan: The Last Padawan as a title is really the latecomer in the Star Wars line, not being part of the original release. Also, it is the first that relies on a non-Original trilogy character. But it might just be the best. 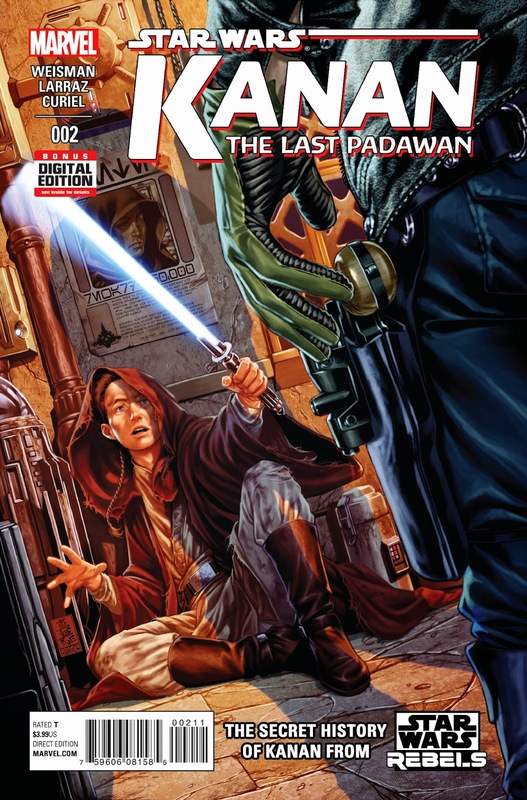 In issue number one, Greg Weisman went deep and philosophical This issue while more action-packed really goes deep in exploring the Jedi way of life. Caleb has never been alone. He went straight from his parents' home to the Jedi Temple. Someone has always watched over him and provided for him. While the Jedi may have taught him martial skills, lightsaber play and meditation, the young man is really not trained to live within the universe. In "Chapter Two: Flight" he is forced to struggle with basic questions of survival and one really does feel for the young man, even if he is really just animated/drawn. Kanan: The Last Padawan #2 for me was even more successful than the first issue. And the Between Kid approved the purchase of next month's issue. So I personally am hoping that the quality art, by Pepe Larraz, and writing can be maintained and this series has a long run. Best title in Marvel Star Wars? No, that honor has to go to Darth Vader. Issue #2 better than issue #1? Both my daughter (age 7) and I thought no, although we both enjoyed this issue and look forward to #3. She didn't say why she didn't like it as much (I suspect it's because the story takes a necessarily darker turn, now that Billaba is dead and Caleb is on his own); I thought not enough plot happened, thanks to modern decompressed storytelling. But the art is gorgeous, and by no means is it a bad book. It beats the flagship title and Princess Leia hands down.